This website was created on Wednesday, September 6, 2017, to support the entire community of Sint Maarten/Saint Martin following the catastrophic events of hurricane Irma. With funds raised through this website we have assisted several individuals, families, and NGO’s working on and around the island. We continue to support the island by contributing proceeds we raise to assist and support local citizens, communities, and businesses. Our initial goal was to keep this website updated with all the latest details to help provide information in one place for those who live on the island, as well as those people who have loved ones in and/or concerns about Saint Martin/Sint Maarten following Hurricane Irma. We’ve tried hard to identify and validate all links on SXM Strong to various resources. SXM Strong supports, promotes and assists the citizens and communities on the island of Saint Martin through sharing of local stories and information about everything this beautiful island has to offer. 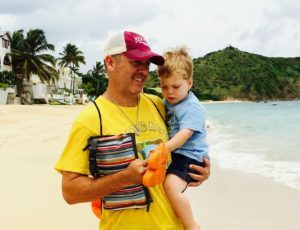 As for me, my name is Jon Ferlise and Iive in Phoenix, Arizona, with my wife and two sons, ages 5 and 6 (and yes, they LOVE SXM as much as we do!). My family considers the island a second home and we’ve been there countless times. We love the culture, the people, the community and the beauty of this small island. The people have always made us feel at home and welcome. This is a small way for me and my family to show our support for an island and it’s people that we hold so dear. If there’s any information you’re looking for, or suggestions you’d like to make, please send a note on the SXM Strong contact page, Twitter or Facebook. You can also find me on LinkedIn here. I’m open to any and all ideas to help promote this wonderful island. If you contact me, I will try to respond and answer inquiries as quickly as possible.